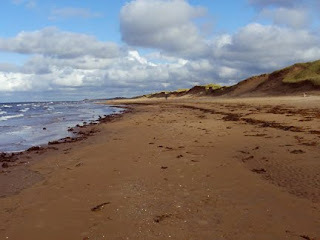 Taking a break from Anne, we visited Brackley Beach. It's September and a bit on the chilly side, but even with that the beach was still beautiful. 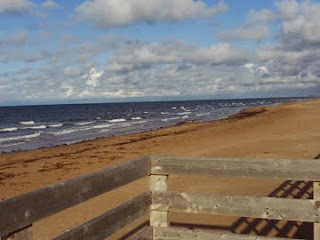 The colors are gorgeous in PEI. On land, it is a symphony of emerald and gold and silver, but on the shores the it is the a warm burnt sienna red of the sand and the deep blue ocean that paint the picture. While I made a little collection of egg-shaped rocks, Squatchie took some photos--I think the first photos he actually took for himself. I guess he really wanted to capture the moment that he was sans-Anne that day!